I just purchased a 2007 Nissan Pathfinder. The front bumper is covered in bug goo and road grime that was obviously left on there for a long period of time. Obviously regular washing does nothing and Im pretty sure the dealer buffed and waxed it due to the shine and white wax left on door seams. So do I have any options to remove this stuff without repainting? Maybe try rubbing compound. That worked on a big scuff i had on my front bumper. Whats the procedure on that? Just use it then follow with a good wax? but, I usually just rub the scratch in tiny circles with a rag with a bit of rubbing compound on it.. then just rinse away the excess.. I did a little online research and it says that rubbing compound should be used as a latch ditch effort where it looks like repaint may be your only option. I tried some polishing compound since its less abrasive. It really didnt do much good. I think the stuff has been on there so long that its messed up the clear coat. Im just gonna leave it be for now cause it looks fine from a few feet away. Eventually I will take it to a professional and let them take a stab at it. Im afraid I will end up messing it up with rubbing compound. Ive never used kerosense on paint. Is that really a good idea? I have never had a problem with it. I have been using it for years to get off tar and asphalt from when they blacktop the roads around here. I put some on a rag and scrub the problem area. then I wash it with soap and water and then wax it. it will strip off the wax so you will have to wax it when you are done. Do not use Rubbing compound !! thats for paint thats oxidized and has no clear coat what so ever. It will scratch the surface and basically ruin it. My best advice to you is to take it to a professional and have them use a dual action buffer on it. 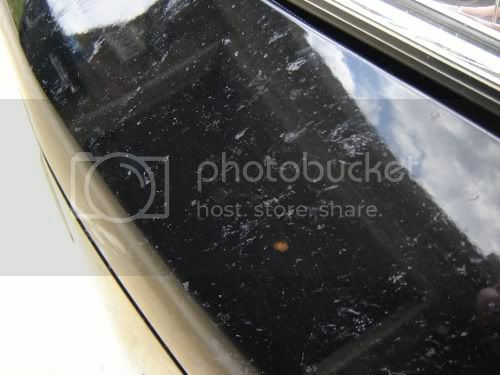 They can clay bar it to remove all the dirt and debris from the surface, then they can polish out all the imperfections. You may have to muster up a couple hundred dollars but it will be worth it to get the job done right. If you do not have the money available to do that, then go pick up a clay bar kit they sell them just about anywhere now. Follow the directions that come with it and clay the area, then get some good wax like meguairs gold class and wax it several times. This should help out for only $35-$40 in supplies. The stuff i use is actually called Polishing compound. Thanks for the suggestions guys. Polishing compound barely did anything. Think I'll stay away from the rubbing compound. I will try kerosene later. Just curious if you have tried using a clay bar and if that did anything for you. wash, clay, wash and then wax should come right out a netted road tar sponge could work to. This will sound odd........use the fabric softner sheets you use in the dryer. Just get it moist....not wet....and rub gently. once you get a small area done wipe it off with a clean wet rag/towel. Dont do it in large areas at a time because you dont want the fabric softner to dry on the paint. I have done this several times and it works like a champ.........once you have gotten to a point you are happy a quick wax job would help to keep future critters from sticking as baddly.